Ceramic Fiber Tape : Ceramic Fiber Tape, Ceramic Fiber Tape Manufacturers, Exporter of Ceramic Fiber Tape, Ceramic Tape, Ceramic Tape Manufacturers. Ceramic Fiber tape is a woven fabric made from our high quality ceramic fiber yarn. The ceramic tape is reinforced with fiberglass filament. Ceramic fiber tape contains a certain amount of binder material which is normally burned at lower temperature and does not affect the insulation property. 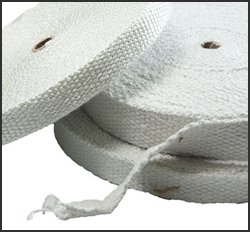 Ceramic Fiber insulation fabrics tapes are woven in netted form made from Ceramic Yarn. Ceramic fiber insulation tapes are available in a variety of thickness from 2 to 10mm. The standard width of the Tape is 25mm to 100mm.